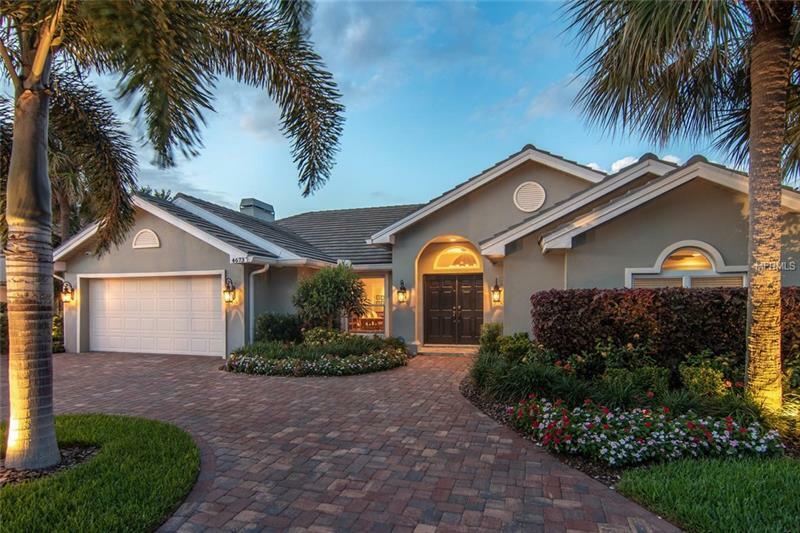 Immaculate waterfront pool home located in the quite subdivision of Venetian Place. Impeccably appointed 4 bedroom, 3 full bathroom, waterfront home is a fantastic investment. Expensive upgrades already in place include Newer seawall, impact windows and doors, HVAC, Pool resurfacing, pavers, patio, new circle driveway, tile roof, and more. Home features HIGH CEILINGS, with French doors that line the back of the home offering stunning water views from every room. Elegant formal living and dining rooms center the home with crown molding. The spacious master bedroom features a walk-in closet, en-suite updated bathroom with large soaking tub, double sink vanity, and separate shower. The kitchen’s wood cabinets, granite countertops, gas range, and spacious bar seating open to the inviting family room featuring a fireplace. The kitchen offers an eat-in area surrounded by a windowed water view. Tucked away two bedrooms offer privacy with a shared full bath. 4th guest bedroom with access to the 3rd full bathroom. Indoor utility room. Enjoy Florida’s ideal weather year-round on the sprawling covered patio perfect for entertaining with built-in grill and green egg. Newer dock with boat lift and second lift perfect for kayak or paddle board launch. This home is located on a wide canal. Sparkling salt water pool. Minutes from vibrant Downtown St. Petersburg and TIA. 20-30 min to many of our world famous Beaches. Come see why so many call Venetian Home! Amenities Additional Fees: Fee is paid quarterly and will vary slightly due to actual water usage.